Tobago is one-half of the twin island Republic of Trinidad & Tobago and is located at the very bottom of the chain of Caribbean islands, just northeast of South America’s Atlantic Coast. Tobago sits in the pathway of not one, but two major oceanic currents. 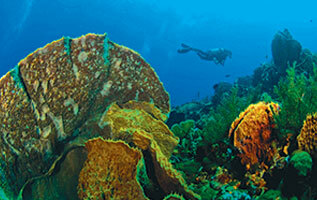 The result is some of the most exciting and unpredictable drift diving in the Caribbean. In fact, Tobago is considered the drift capital of the world. These same currents play a pivotal role in shaping the region’s unique underwater ecosystem because they bring the clear oceanic waters that hard corals require for survival. From the south, the Guyana Current skirts the South American coast, then pushes north towards Tobago. During Venezuela’s rainy season, floodwaters from the Orinoco River add their flow to the mix. As this nutrient-laden water moves north it triggers enormous plankton blooms that sustain a host of filter-feeding organisms ranging from sponges and soft corals to manta rays. Tobago is known for being laid back, relaxed and quiet and, most importantly, it is surrounded by a number of outstanding dive sites for students, novices and seasoned divers seeking a hearty adrenaline rush. 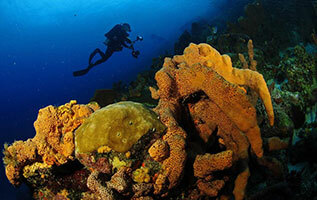 The conditions in Tobago are ideal for learning to SCUBA dive. The waters are consistently warm at 82 degrees Fahrenheit (27 degrees Centigrade) and visibility can be as much as 120 feet (36 meters) down! Sisters Rocks – An amazing site consisting of boulder-type formations caused by volcanic activity the results of which are 5 pinnacles emerging from a depth of over 130 feet (39 meters). Sisters is also known as the home of the Great Hammerheads. Japanese Gardens – This is one of the most pristine reefs left in the Caribbean where you drift through hundreds of Creole Wrasse and sponges of every imaginable color and size. You can also swim through the Kamikaze Cut at a depth of 40 feet (12 meters). Wreck at Maverick – This former inter-island ferry is the best wreck in Tobago. She is 340 feet long and sits in 110 feet (33 meters) of water at her lowest point, her top being in just 60 feet (18 meters) of water. 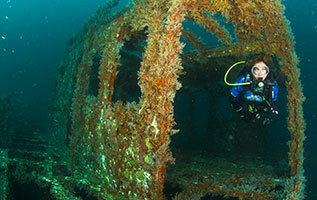 The wreck site is abundant with pelagics including jacks, tunas, cobia and large schools of baitfish. Mt. Irving Wall – This is the perfect dive site for beginners with its sandy area on one side and the wall on the other, offering a controlled environment with loads to see such as sea horses, short-nose batfish, golden hamlets, eagle rays and stingrays. Kelleston Drain – The Town of Speyside in northern Tobago is famous for this site because it has a brain coral colony that has been growing undisturbed for centuries. This single colony is as large as a truck and is the largest single brain coral colony in the world! And the adjacent reef is full of colorful sponges, great branching corals, and is a great place to see a wide variety of fish.